Mid-Life Cruising!!! : NKOTB - Missed Anything? On this day after Thanksgiving, "Black Friday", I am wrapping up the NKOTB series. I can't believe that I started this series almost 4 months ago! With the holiday season officially started (still can't believe it) and 17 posts in this series, I thought it was a good time to wrap things up. I hope that this series will be as helpful to others as it has been to Ken and I. Thanks to you and your comments, we have a lot of great information to refer to as we continue to prepare Nirvana and ourselves for cruising full-time. There is a lot to consider when choosing the cruising lifestyle! I tried to cover most of the aspects of cruising ... from the emotions of making a huge change in life's course, to family reactions, to choosing the right boat and adapting it to the cruising lifestyle. Please feel free to mention anything that you think I should have included. We are always eager to hear your thoughts. Ken and I are so thankful for all of your friendly advice, and we hope that this blog will inspire others to live their dream. We have a lot of "anchors" holding us back, but we won't give up and we know we'll get there. If we can do it, anybody can! 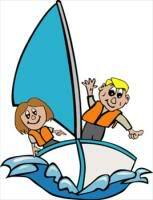 Boating is a learning curve. You'll always run into something that you'd not experienced before. As you boat more and more you'll learn to adapt to these things quickly and move forward. There isn't anything I'd rather do than boating. Big cruise ship too. Can't forget about that. You'll do fine. You are going to do what you love and that's the secret to success in anything. The really important thing is to get to it. If I would have waited till the boat was 'perfect' and the time was 'perfect' I would still be waiting and would have missed the best sixteen years of my life. I think others will agree. You need to have what is needed to be safe, but other than that, shove off. The motto on board my boat is from a Garth Brooks song, 'don't sit upon the shoreline and say you're satisfied, choose to chance the rapids, dare to dance the tide.' Good luck guys. What a neat series! I will have to go back and read them all to catch up. Looking forward to your next creative post idea! Cheryl, Chuck is right! Some folks never leave the docks, so make sure she is dry and safe, and go for it! Happy Holidays! Yes, we agree with Chuck too! We're not waiting for more stuff on the boat or more money .. just trying to get the darn house fixed up and then sold .. then we're off!